How Can Food Distributors Support Schools with Salad Bars? 1 How Can Food Distributors Support Schools with Salad Bars? Billi Grossman, R.D., L.D. Sysco NM Hi, My name is Billi Grossman. I work for Sysco NM, the largest food distributor in America. I want to talk for a few minutes about how a food distributor can support you in your efforts to serve salad bar at your school. 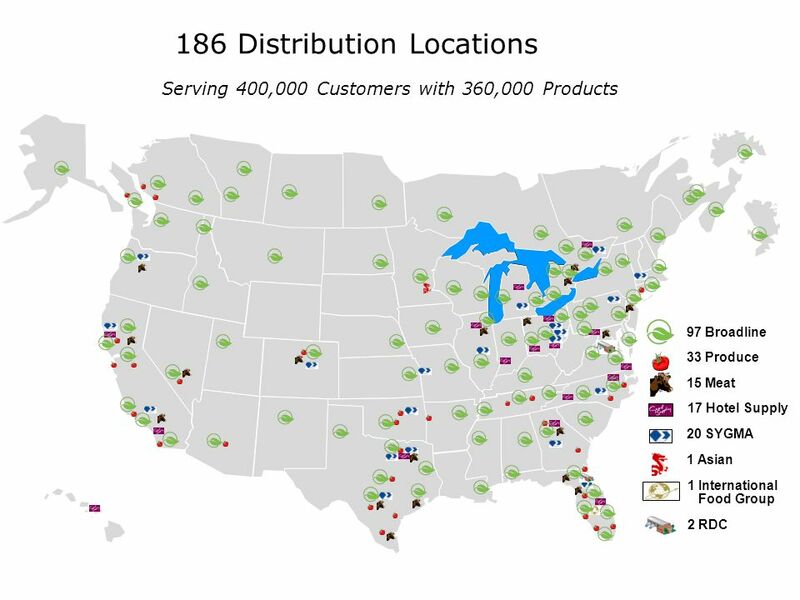 Serving 400,000 Customers with 360,000 Products 1 International Food Group 17 Hotel Supply 33 Produce 20 SYGMA 97 Broadline 1 Asian 15 Meat 2 RDC This is a published map of all the different sites that Sysco has distribution centers. In addition, there are many smaller distributors across the country. Some of these specialize in specific products such as meat or poultry. But the point is, that no matter where you are, there is a food distributor near you who can service your school. 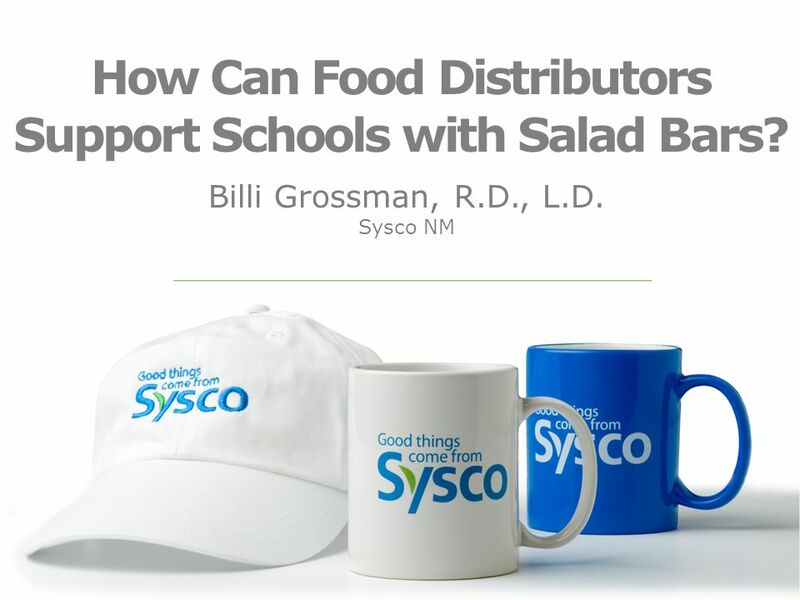 One thing to note: Sysco NM delivers to most of the individual schools across NM and AZ. In a few cases, where the school may be out several miles of dirt road that is not passable in the winter for our big trucks, we will make arrangements with the school to deliver to the next nearest school and staff from the school will come and pick up the food. 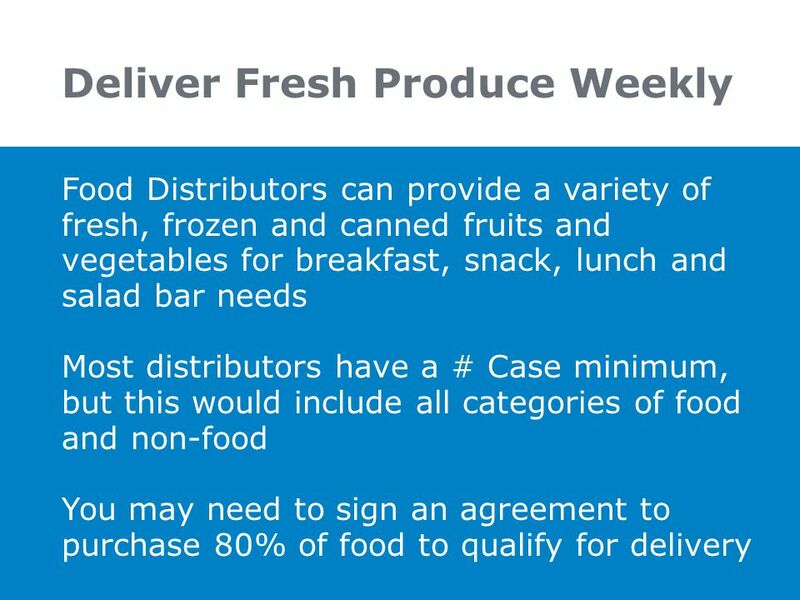 Food Distributors can provide a variety of fresh, frozen and canned fruits and vegetables for breakfast, snack, lunch and salad bar needs Most distributors have a # Case minimum, but this would include all categories of food and non-food You may need to sign an agreement to purchase 80% of food to qualify for delivery Food Distributors can provide a variety of fresh, frozen and canned fruits and vegetables for breakfast, snack, lunch and salad bar needs. You can find just about any type of produce you might imagine. In order to service your accoutn, your distributors may set a # Case minimum which would encompass your entire order, food and non-food. Your distributor is going to want the bulk of your business if they are delivering to you each week. Because they can then forecast volume, they will work with the manufacturers to get you the best price possible and reduce out-of-stocks. In choosing which distributor to which to commit your business, you will want to look, not only at price, but at the services they provide. 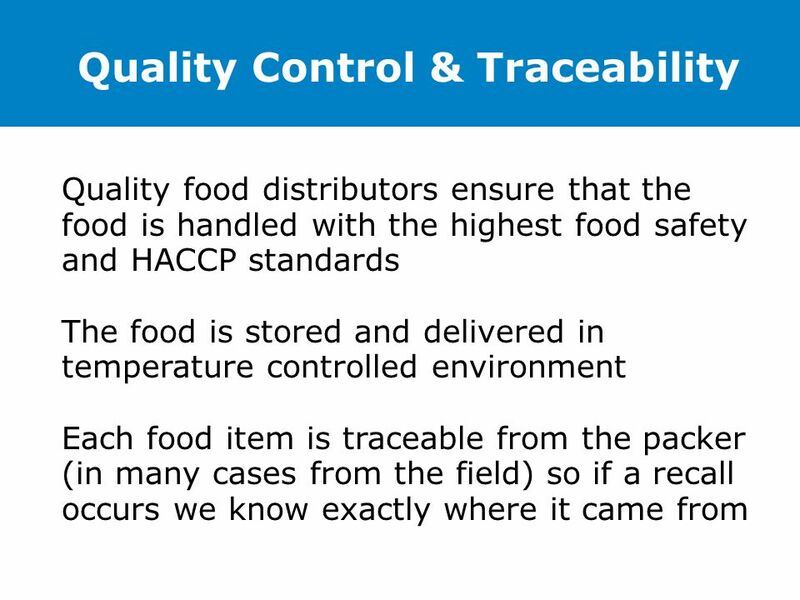 Quality food distributors ensure that the food is handled with the highest food safety and HACCP standards The food is stored and delivered in temperature controlled environment Each food item is traceable from the packer (in many cases from the field) so if a recall occurs we know exactly where it came from A qualified food distributor will have systems in place to ensure the highest quality and food safety. The food will be stored and delivered in a temperature controlled environment. The warehouse and trucks will be clean, inside and out. In addition, in the unfortunate case of a recall, the food will be tracable. In our company, foods are tracable to the packer and in many cases we know exactly what field it came from. We monitor all trucks that come into our warehouse, corporate and independent, from the time they leave their origin for temperature every 15 minutes. When you purchase from local grocery stores or big box stores, they have no tracability; no idea where that produce came from. 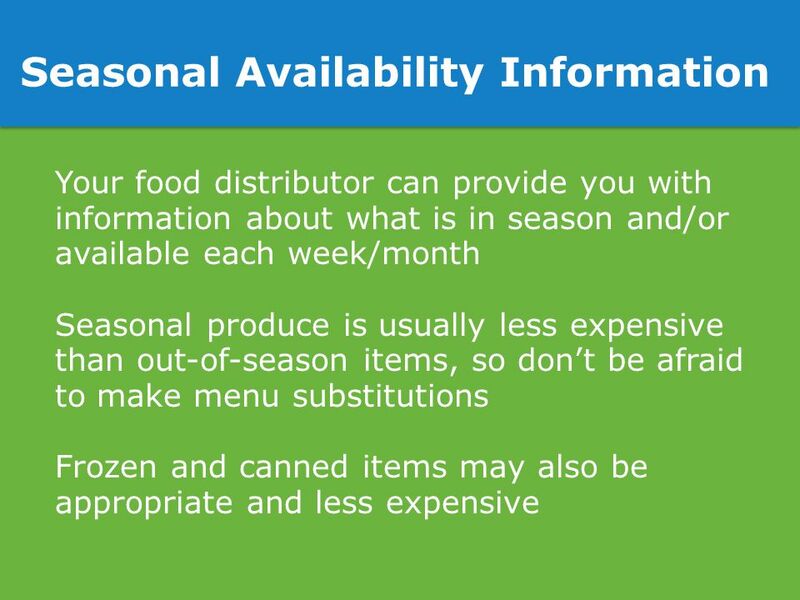 Your food distributor can provide you with information about what is in season and/or available each week/month Seasonal produce is usually less expensive than out-of-season items, so don’t be afraid to make menu substitutions Frozen and canned items may also be appropriate and less expensive You can save money by purchasing seasonal produce. Your sales representative will be able to inform you of what is available and in season. If plums are a really hot item at your school and you really want them on the salad bar in the middle of winter, you can use canned, frozen, or dried. 6 Use these to teach students about new and different foods. 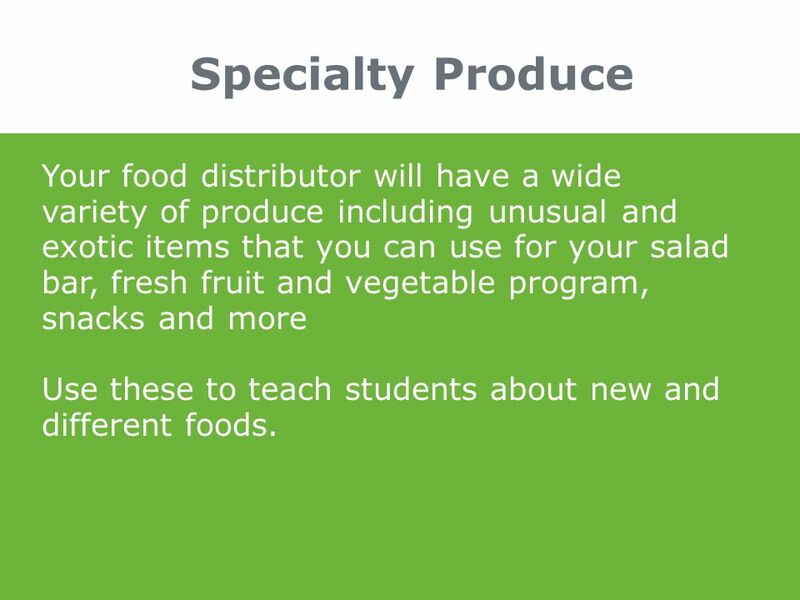 Specialty Produce Your food distributor will have a wide variety of produce including unusual and exotic items that you can use for your salad bar, fresh fruit and vegetable program, snacks and more Use these to teach students about new and different foods. They should have a variety of specialty items, too that you can use for your Fresh Fruit and Vegetable program and other “teaching moments” to give students exposure to new and different foods. 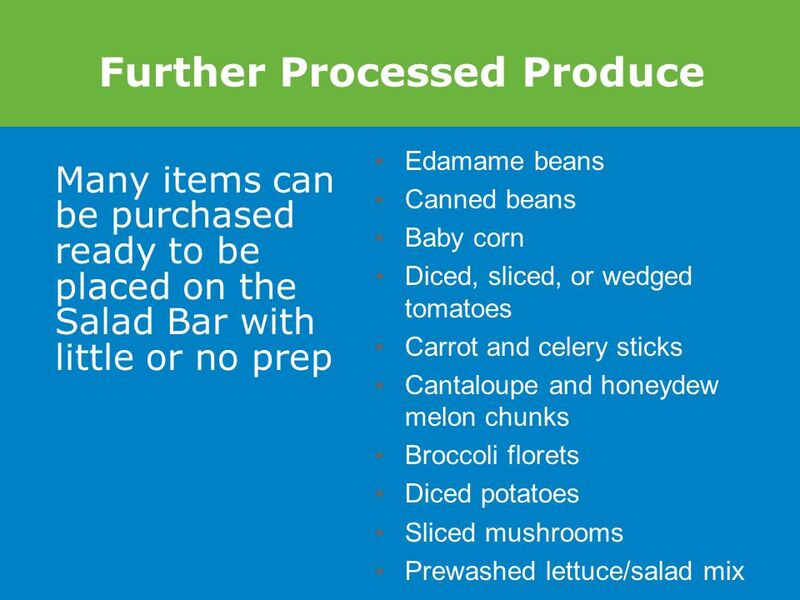 Edamame beans Canned beans Baby corn Diced, sliced, or wedged tomatoes Carrot and celery sticks Cantaloupe and honeydew melon chunks Broccoli florets Diced potatoes Sliced mushrooms Prewashed lettuce/salad mix Many items can be purchased ready to be placed on the Salad Bar with little or no prep The salad bar does not have to mean a lot of prep time. Many food items can be purchased already prepped and ready to be placed in crocks or pans. These are just a few examples, there are many more. 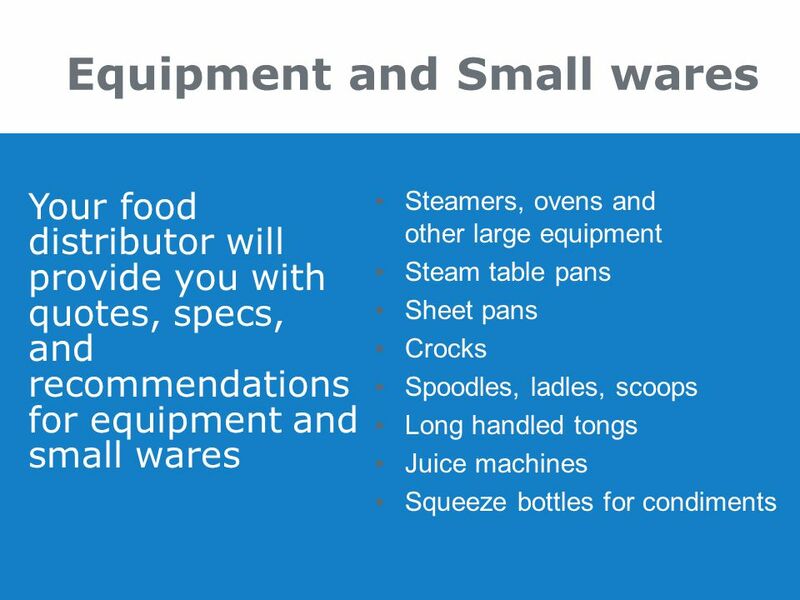 Steamers, ovens and other large equipment Steam table pans Sheet pans Crocks Spoodles, ladles, scoops Long handled tongs Juice machines Squeeze bottles for condiments Your food distributor will provide you with quotes, specs, and recommendations for equipment and small wares You food distributor will also be able to assist you when you need equipment, whether it is a capital expense, such as ovens, steamers, etc or everyday smallware and appliances such as blenders, crocks, pans, utensils, etc. Sometimes, equipment, such as juice machines, coffee urns, paper towel and napkin dispensers are available at little or no charge from the manufacturer in exchange for using that specific manufacturer’s product. 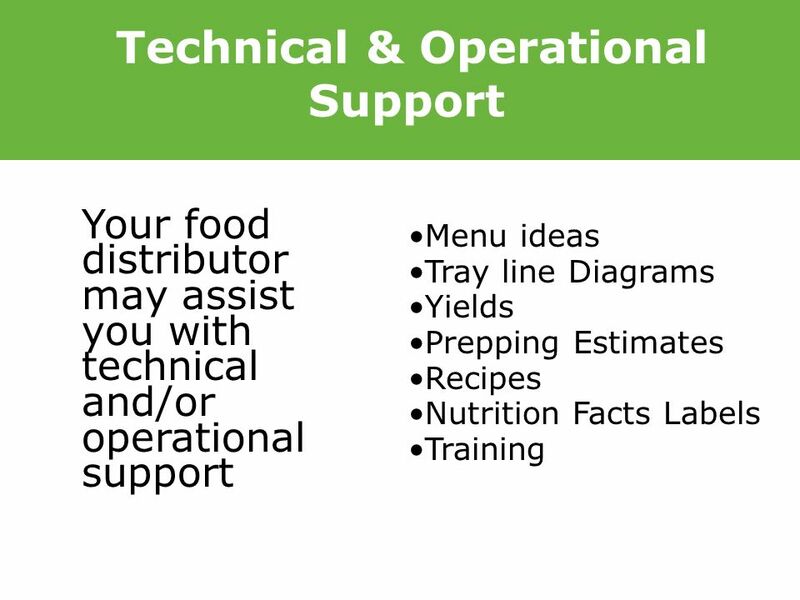 Your food distributor may assist you with technical and/or operational support Menu ideas Tray line Diagrams Yields Prepping Estimates Recipes Nutrition Facts Labels Training The food distributor may be able to assist you with menuing, recipes, and operational tools, and training. They will provide you with nutrition facts labels and CN labels as available for every product you purchase. Don’t be afraid to ask for what you need. There are many resources available through either the distributor or the manufacturers. 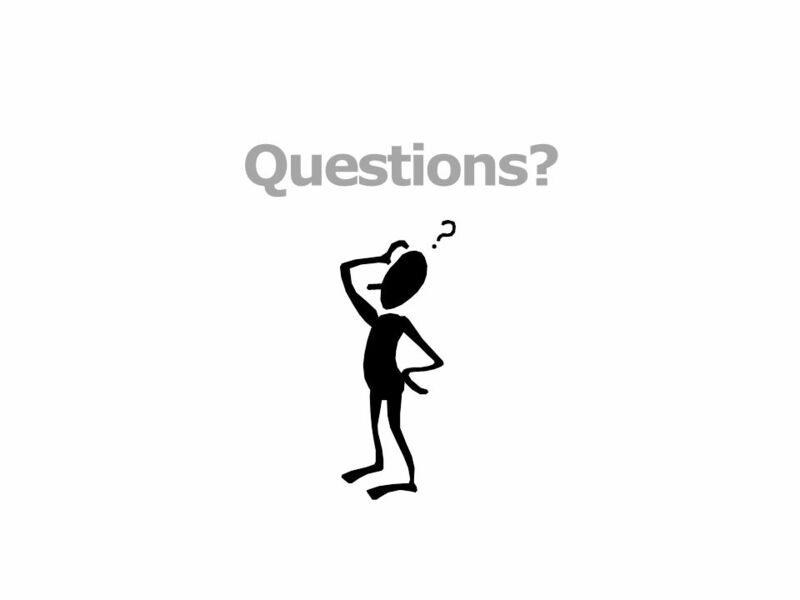 Download ppt "How Can Food Distributors Support Schools with Salad Bars?" Menu Records for Self-Preparation Sites Virginia Department of Health Special Nutrition Programs 2014. Fruit and Vegetable Bar Tutorial Food Safety Washing Fruits/Vegetables  All raw fruits and vegetables shall be thoroughly washed (with friction) in. Meal Pattern Menu Planning. Menu Planning Principles Basic menu planning principles are a great starting point to meet both food preferences and the nutritional. The Code of Federal Regulations (section (a)(1)(ii)(3), requires that programs participating in the National School Lunch and School Breakfast. Real food for all™ Monday TuesdayWednesdayThursdayFriday Lunchr: choice of 1% or fat-free milk; fresh fruit. Monday February 2 Tuesday February 3 Wednesday February 4 Thursday February 5 Friday February 6 Breakfast Pancakes Bananas Milk Oatmeal Raisins Milk Scrambled. Menu Exercises. CACFP Meal Patterns Breakfast – Milk – Grain/Bread – Fruit/Vegetable Snack (2 of 4) – Milk – Grain/Bread – Fruit/Vegetable – Meat/Meat. Real food for all™ Monday TuesdayWednesdayThursdayFriday September Lunch - PSN No School Labor Day Hot Meatball. PRODUCTION RECORDS PRODUCTION RECORDS Summer Workshop June 2007. Metropolitan Washington Council of Governments August 19, 2011 Making the Healthy Choice the Easy Choice for Students Fresh Fruit & Vegetable Program Let’s. Real food for all™ Monday TuesdayWednesdayThursdayFriday Lunch: choice of 1% or fat-free milk; fresh fruit available. Real food for all™ Monday TuesdayWednesdayThursdayFriday Lunch: choice of fresh fruit available daily. All meals. The Vegetable Group In the New Meal Pattern. The Vegetable Group In the New Meal Pattern. Real food for all™ Monday TuesdayWednesdayThursdayFriday Lunch: choice of 1% or fat free milk, fresh fruit available. Food Service Update Overview Sodexo’s Services Nutrition Healthy Hunger Free Kids Act POS investment Environmental Impact Equipment Meal Counts. Growing a Healthy Brain Meals (Assume all food presented is organic, and free from hormones, antibiotics, food additives and chemicals. All meat is also. Real food for all™ Monday TuesdayWednesdayThursdayFriday 12 56789 1213141516 1920212223 2627282930 October Breakfast Menu Holiday Spice Muffin Fresh Fruit.